We are in the very early stages of a feasibility study looking at the options for a new junction, 18a, to link the M4 with the A4174 ring road. Next month, we will be running a formal consultation from August to October and inviting people to comment on the two options; an Eastern option and a Western option (see attached visual). Work on the study is not due to be completed until 2018 therefore it is important to stress that these proposals are at an early stage, no formal decisions have been taken and there is not a preferred option on the table. Further details on how to comment will be provided nearer to the consultation launch date, later in August. 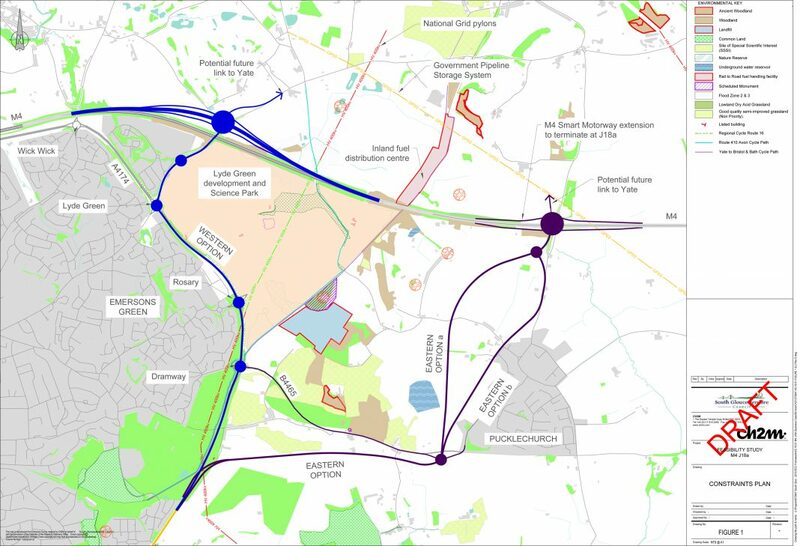 Cllr Colin Hunt, Cabinet Member responsible for transport, said: “We recognise that creating a new motorway junction is not something that will be popular with everyone, but there is a very real need to ease congestion in this part of South Gloucestershire and provide better access to key employment hubs and residential areas. We received funding from the Department for Transport to carry out a feasibility study, this work is being carried out with support from Highways England.